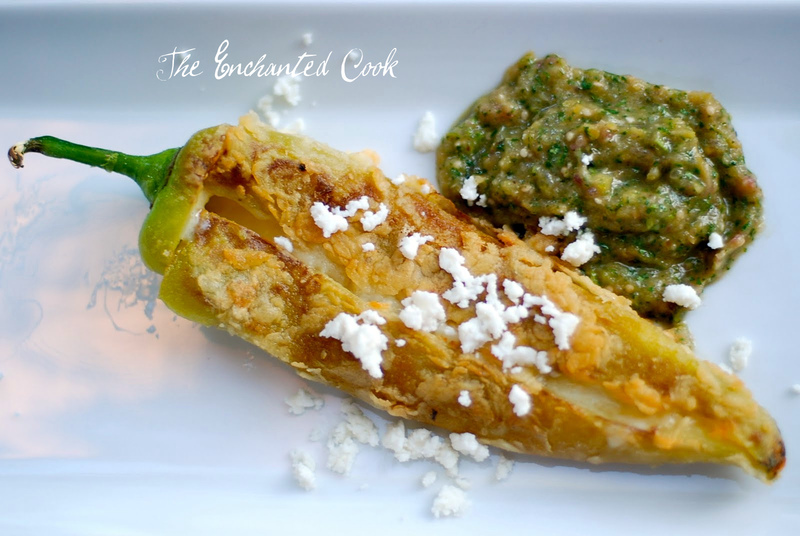 Chile Relleno is not a difficult dish to make but it does require just a little bit of knowledge on how to prep the chile peppers prior to stuffing. You'll need to fire-roast them first to remove the outer skin and then de-seed them. The easiest way to fire-roast them is to put them under the broiler and blister them on all sides. They will crackle and pop a little but once they start to blacken that's when they're ready to remove. Immediately place them in a zip top plastic bag and seal (or you could use a covered bowl), then allow to sit for about 5-10 minutes. The steam will cause the outer skin to loosen and make it easy to remove. Once you have the skin removed, cut a small horizontal slit across the top under the stem extending half way around. Then make a vertical cut starting at the middle of the horizontal cut and going all the way down to the end, in the shape of a "T". Remove seeds by gently running your knife down the membrane and discard the seeds. Your pepper is now ready to stuff. Cut Monterey Jack cheese into strips and stuff each pepper with an equal amount of cheese. Close peppers. Place egg and water mixture (egg wash) in large shallow bowl and place flour in a separate large shallow bowl or plate. Take each stuffed pepper and while keeping it closed, dredge or coat in flour, then egg wash, then flour again and set aside. In large frying pan, heat oil to medium. Carefully, place stuffed peppers in pan with the seam down and allow to brown for about 1-2 minutes, then flip and allow other side to brown. Remove, lightly salt and serve with salsa (recipe follows). Remove tomatillos from their outer leaves and discard the leaves. Tomatillos will feel sticky. Rinse and halve tomatillos then place on parchment paper lined baking sheet. Quarter onion and place on pan with tomatillos. Drizzle olive oil over vegetables and lightly season with kosher salt. Place in oven and roast for 20-30 minutes until lightly browned. Let vegetables cool slightly and then place in food processor. Be sure to include the drippings from the pan. Add cilantro, garlic, and lime juice, then puree. Add kosher salt if necessary. Serve alongside the Chile Relleno and with tortilla chips, if desired.